Care Perfections | Infinite Possibilities! As our loved ones grow older, we try to find the best ways to keep them comfortable and happy. Our priority for our loved ones is that they are taken care of, the way they have taken care of you. It is time to return the favor. There are many options for senior care that we have to choose from. As does everything, they each have their pros and cons. The most common option that people think of when it comes to senior care is: nursing home. A nursing home is a skilled nursing center that provides 24-hour supervision and care. But, not all seniors need the around-the-clock care or supervision. Some need light assistance, while others may need help bathing, running errands, or just need someone to keep them company. This is where Home Health Care comes in handy. With the availability of up to 24/7 coverage, home health care boasts the assistance your loved ones need with the ability to maintain the privacy and comfort of their own home. 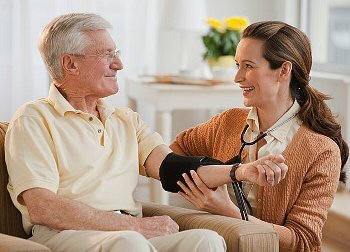 Home Health Care offers a variety of services that are available to make life easier for our elderly loved ones. It is broken down into Skilled Nursing and Non-Skilled Nursing. Skilled Nursing centers around therapeutic approaches to benefit the client in their own home. These nurses come in to assist with wound care, burns, decubitus ulcers, catheter care, insulin injections, and more. These nurses usually come for a visit <2 hours to perform the necessary duties and then leave. Non-Skilled Nursing centers around companionship, personal care, and assistance with the client’s activities of daily living. 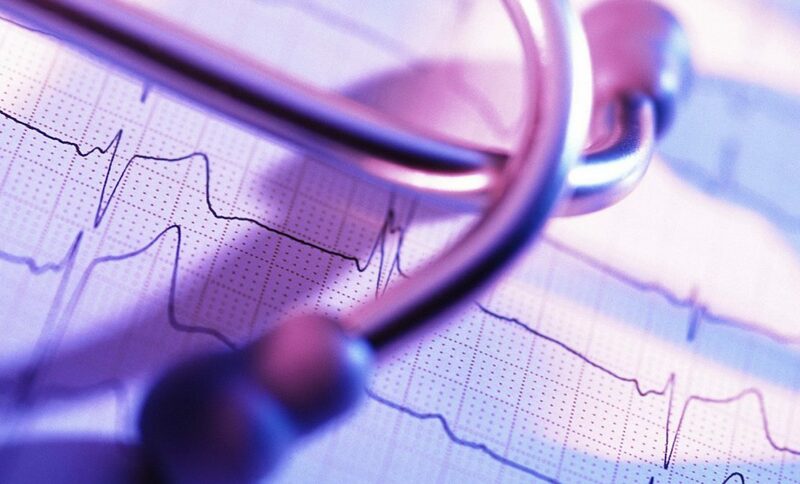 These are typically Certified Nursing Assistants, Home Health Aides, or Personal Care Aides. All of the above are certified professionals that are specifically trained to work with a client. Many agencies work to provide aides for clients. Agencies, such as Care Perfections, offer aides to help clients in their homes to remain private and comfortable. We help with the hassle of Medicaid paperwork, finding a compatible aide, plan of cares, and we even offer a FREE Nurse Assessment. We remain steadfast in our ways to promote Home Health Care as a safe and comfortable alternative. As a senior, your body changes as you age. 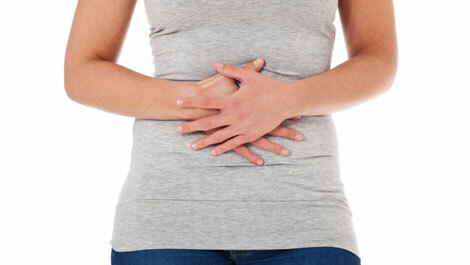 There are physical changes such as: heart rate, breathing ease, digestion, and many others. But there are also mental and emotional changes that happen as well. For example: while a woman goes through menopause, her physical body is changing, but she also experiences the overwhelming sensation of many emotions, heat flashes, etc. Each change comes over the course of being an elder. Many elders seem to ignore the emotional ones the most. 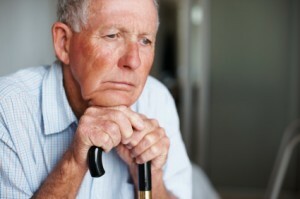 While sadness and grief may come normally during aging, depression is not a normal part of aging. There are many symptoms of depression which overlap into typical sadness, making it harder to be noticed by a doctor, loved one, or even yourself. Depression is common and the symptoms can sometimes be hard to spot. How can you help your loved ones? 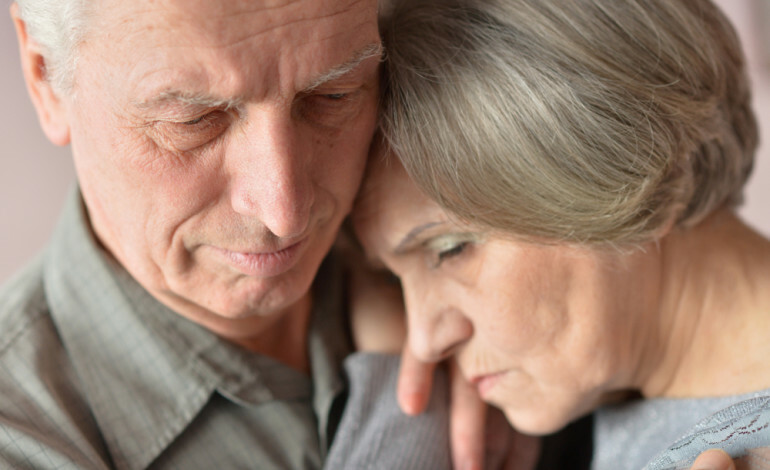 There are many different ways to intervene and help your loved one with depression. First and foremost is to get them a doctor’s appointment. The start of therapy is a huge step towards combating depression. Listen to them. Make sure you note their concerns, worries, and listen. Knowing that there is someone willing to listen and try to help is a huge relief. Never ignore comments about suicide. Always report it to their doctor or therapist. Go on walks. Do activities that you both enjoy. And also, remind them that with time and medication, the depression will lift. Have hope. Getting exercise can be tough when your bones and joints aren’t what they used to be. Running and even walking can really be a pain in the knees. Lifting weights could be dangerous if not lifted properly and many seniors cannot strain themselves. If only there was a better way! Well there is: Water Aerobics! Going to the pool has always been a wonderful pastime amongst families for generations. Swimming, a very popular sport, is a great cardiovascular workout without all of the strain on joints and muscles. With the easy resistance of the water, workouts are less impacting and can potentially burn more calories than a daily jog! While working out the heart, this exercise can slow down the age-impact of muscle loss and help you gain metabolism. And don’t worry if you don’t know how to swim: you’re in waist deep water. 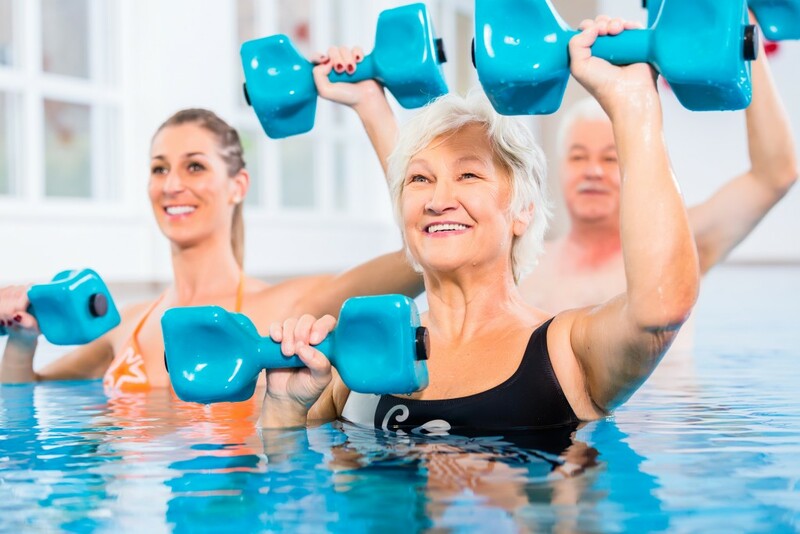 Arthritis, a very common ailment amongst senior 55+, has been thwarted by the recent study discoveries of the benefits of aqua exercise. The symptoms of rigid joints and arthritis dissipate as you enjoy your fun in the water; you don’t even realize you’re exercising! In the water, exercise also helps with lung capacity and water safety. Everyone needs to be careful around water and so with these types of exercise, you learn more about water safety, how to float, and how to swim to safety. Many of these lessons are life saving in the event of a water accident. Just remember: it’s never too late to start! It’s amazing what our four-legged companions can accomplish for us. There are numerous stories and articles of what dogs, cats, and other domestic pets have done for their owners. Being in a facility such as a rehabilitation center, assisted living, or a hospital can really take a toll on someone’s mental well being. Perhaps they feel sadder than normal, have crying spells, or just feel lonely. This is where therapy dogs come to save the day. Trained to detect the emotional stress and upset of a human, a therapy dog knows when to cuddle up to a human for emotional foundation. Multiple experiments have shown that just petting a pet can immediately make someone happier. 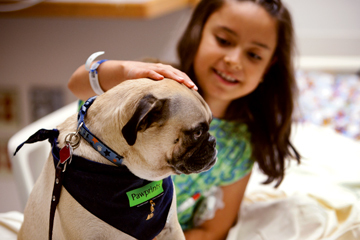 Therapy dogs mostly visit hospitals and rehab centers to provide comfort for the patients who have a stay ahead of them. Numerous units have adapted this practice of bringing therapy dogs in. 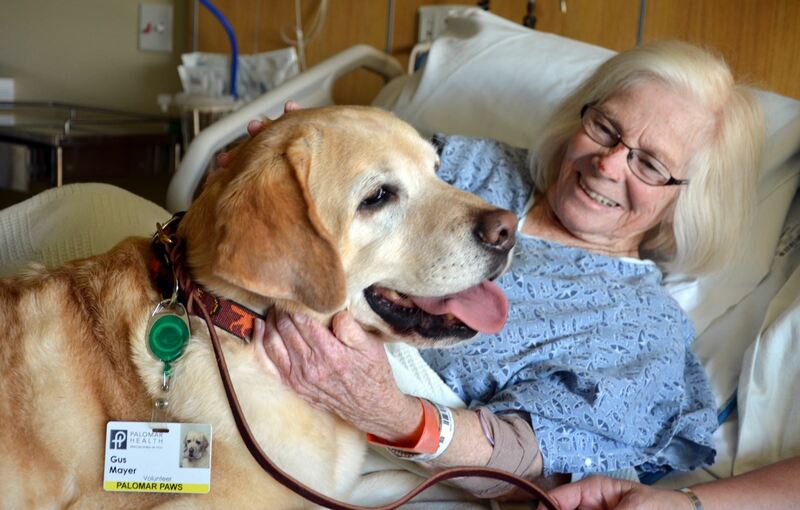 Hospice, Pediatrics, Oncology, and Trauma Units have all welcomed therapy dogs into their units. For all of our Veterans out there: a therapy dog is a huge benefit for you! They can acknowledge the symptoms of post-traumatic stress disorder (PTSD) and they can calm you down within minutes. They are more than a man’s best friend; they are man’s healer. We all know summer brings a lot of fun in the sun! But, as we get older, we need to make sure that we aren’t at risk for heat-related sicknesses or symptoms! Summer brings fun memories and trips to places such as the beach, hiking, monument visits, and tours to different museums. Please keep in mind that our elder family members are more at risk for being negatively affected by the heat. In this post, we are going to acknowledge some ways that we can make sure we avoid elderly heat stroke and exhaustion. Thanks to our friends over at aplaceformom.com, we found an article that would help you stay safe in the sun! Did you know that the University of Chicago Medical Center released a study that 40% of heat related fatalities in the United States are elders ages 65 and above? With such information, we want to make sure we stay cool and hydrated to have a fun and safe summer. Make sure you keep an eye on that heat index! Watching the weather and the morning news will give you a good understanding of how hot it’s going to be for the day. The heat index takes into account humidity and temperature, giving you an overall glimpse into the heat of the day. Take it easy! Everyone wants to enjoy summer and that means going outside to soak up some sun rays. But make sure that you aren’t overexerting yourself by walking long distances or exercising under the burning sun! Drink water and plenty of liquids! Try to avoid soda, alcohol, and caffeine when the sun is beaming hot. Instead, swap out that Coke for a mineral water or a Gatorade. This will keep you hydrated and you won’t risk fainting. Dehydration tends to be the root of many heat-related problems. Stay Indoors During Mid-Day Hours! Instead of heading out to do your groceries and shopping at noon, try heading out before 10 am or after 5 pm when the heat has calmed down some. Appropriate Clothing! Make sure to avoid dark, thick, and long clothes during the summer. Take the chance to go with shorts, short sleeves, and lighter colors to avoid calling too much sun to you. Air Conditioned Environments! Instead of taking that hike outside in 99 degree weather, why don’t you enjoy a nice air conditioned museum or art gallery? You can see sights and beautiful places that are air conditioned! Stretching is a great way to warm up your muscles and improve flexibility! Stretching has many benefits for the body including: improving arthritic symptoms, lowering blood pressure, and relieving stress that knots up the muscles in the neck, back, and shoulders. For seniors, it is especially important to make sure that you keep your body nimble! Seniors can exercise gently by doing light stretches in chairs, standing, or even in the water. Provided below is a video of sample stretches that seniors can do at home in the comfort of their own chairs. It can be done during television shows or commercials. It is important to keep the blood pumping and to keep stress away from your muscles. Remember: stretching is only beneficial when done slowly. If you stretch too fast, you’re at risk of pulling a muscle and/or injuring yourself. Remember to breathe, stretch slowly, and to repeat these movements. This will help prevent injury in the long run!